The human hip must support a considerable load. This joint supports the greatest load in the entire body. 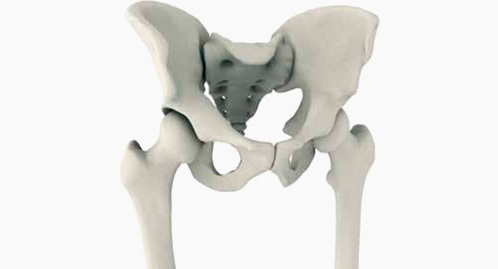 As it is a spherical joint, the range of hip motion is very broad. It is involved in practically all the movements of the body. A healthy hip supports approximately 1.5 million movements, known as “load variations”, per year. Not only does it constantly support the normal weight of the body, but, based on the type of movement, it supports a load much greater than that of the body. Walking slowly subjects the hip to three times the body weight while walking fast subjects it to up to seven times the body weight. The hip joint connects the femur (thigh bone) to the acetabulum in the pelvis. The femoral head is spherical and is located at the top of the femur. It is covered with smooth cartilage and during each movement it slides within the acetabulum, which is also covered with a thick layer of cartilage. A joint capsule encloses the hip joint and together with the surrounding muscles, tendons and ligaments, stabilizes the femoral head in the acetabulum during movement. The internal covering of the joint capsule produces a viscous fluid, known as “synovial fluid”. This nourishes the joint cartilage and preserves its elasticity, while at the same time maintaining a space between the two bones of the joint. In this way, movement is smooth and not painful. Joint problems are one of the main causes of illness. X-rays in 20-40% of people in their 60s show signs of arthritis. About a third of these complain of pain. Hip arthritis is one of the most common joint pathologies. Arthritis is the gradual wear and tear of the joint surfaces, that is to say, the cartilaginous layer that protects the joint is destroyed and can no longer cushion the strain imposed on it. The bones rub together within the joint, wearing away and becoming deformed. The result is intense pain, which initially is felt only after a certain amount of physical exercise, but, as the disease progresses, the pain is felt more frequently, until it arises even when resting. At the end stages, most patients complain of constant pain. Generally, hip pain is mainly felt in the inguinal area from where it can irradiate to the entire thigh up to the knee and even on and past the buttocks. In most cases, the causes of arthritis are unknown. However, the factors and diseases which promote the onset of arthritis are known. The main causes are age and the natural deterioration of the joints over the years. With age, the skeleton weakens and degenerates. However, bad posture, excessive strain and obesity are additional risk factors. Many people acquire hip arthritis due to sporting activities. 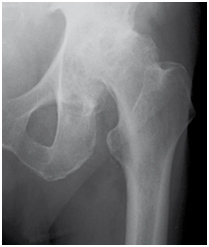 Potential predisposing factors are: joint inflammation, caused by rheumatic or metabolic diseases, an insufficient blood supply to the hip joint and the degeneration of the femoral head known as femoral head necrosis. Accidents and injuries at the level of the cartilage or pelvic, acetabular and femoral fractures can also be responsible for joint degeneration. The last but no less important reason for hip arthritis is congenital hip deformity, which can cause painful joint problems. 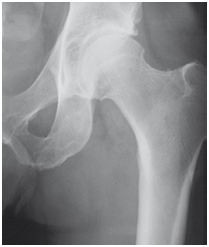 Hip dysplasia manifests during infancy when the acetabulum is still not completely developed, with a soft femoral head which is unstable in the acetabulum. Today it is routine to subject newborns to tests to exclude this pathology. Less serious cases lead to slower development which can however be corrected in the first weeks after birth. In more serious cases the baby must be subjected to conservative therapy, for example with an abductor, so that the acetabulum can form properly. Surgical intervention is also a possibility in some cases. Serious, untreated dysplasia can permanently damage the hip, causing pain and the subsequent development of arthritis. The pathological alterations of the hip joint are generally visible from X-rays. X-rays make the radiographic film turn black. The different levels of absorption of radiation by the tissues produces a natural contrast. The soft tissues such as muscles, tendons and fatty tissue absorb very little radiation and are therefore not seen. The bones, on the other hand, absorb a lot of radiation and they create white shadows on the radiographic film. In the case of arthritis, the destroyed cartilage is not visible. The orthopaedic surgeon is however able to identify the loss of cartilage due to the distance between the tips of the joint. The bones, bony deformities and bone growth can be used to indicate the stage of the arthritis. During a CT scan, X-rays are recorded by various detectors. A comparison of the rays measured and emitted provides information on the tissue under examination. Using this information, the computer produces sectional images. The tissues adopt different tones of grey which can be distinguished from each other. A CT scan clearly shows bone damage and also identifies the soft tissues such as the muscles and cartilage. Magnetic resonance imaging (or magnetic resonance tomography) does not use X-rays, but magnetic fields. The human body is composed of numerous biological magnets. An MRI scan is able to measure when, where and which type of energy is emitted by the organism and it converts this information into sectional images. The structures of the internal part of the joint, such as the cartilage and ligaments, are clearly visible with this scan. Even though CT and MRI scans are important, X-rays are the most important tool with which to assess hip diseases.